I support today’s women-helping-women movements because we create our greatest impact when we work together and support each other. That is how we can transform our lives and the world. I also believe that to truly unleash a woman’s full potential, we have to reach out to young girls and give them the tools they need for a truly empowered life. That’s why I was excited when I heard about the achievements of Tsvetta Kaleynska. Tsvetta was born in Bulgaria in 1988 and is the daughter of a university professor and a doctor. Her experience growing up in Eastern Europe then relocating to the United States showed her how freedom can be defined in entirely different ways. With this new understanding, Tsvetta became passionate about wanting to help other young Bulgarian girls live a life where they too could feel empowered. In 2004 while still in Bulgaria, Tsvetta attended a US Peace Corps empowerment initiative camp called GLOW, which stands for Girls Leading Our World, and says it changed her life. GLOW began in 1995 with the Peace Corps in Romania, and launched in Bulgaria in 2000, to address the emotional and educational needs of adolescent girls. The program was so successful that over the last 20 years it has been implemented in many other countries around the world. Today in Bulgaria Leadership Academy GLOW is a seven-day experience that is aimed at helping young Bulgarian girls reach and explore their potential as future leaders. The academy is based on the informal learning method “peers teach peers,” which means that leaders are former participants in the academy, who showed great leadership and teamwork skills, commitment and motivation. Leadership Academy GLOW gives the young women the opportunity to identify and develop skills, demonstrate their strengths, increase their knowledge of current issues, and nurture self-confidence, which enables them to make valuable contributions to their own communities. Approximately 70-80 girls a year take part in the camp and it also gives them a chance to learn English which is a huge selling point because Tsvetta says there aren’t a lot of opportunities for girls to learn English regularly. After several years of ramping down, The Peace Corps phased out the GLOW program at the end of 2013 after 13 years of successfully enabling girls to have the vision of what a better future looks like. That was not going to happen to the young women of Bulgaria though, not on Tsvetta’s watch. She knew that GLOW changed her life, that’s why for the past eight years she has made it her mission to keep GLOW going in her home country. While she originally planned to help out with GLOW fundraising, over the years has established herself as the volunteer leader of the organization. She manages all aspects of the camp, including the successful delegation of each department to volunteer staff. In 2014 her hard work was recognized in a big way, when she won the Steve Award for the ‘Women Helping Women Globally’ category. 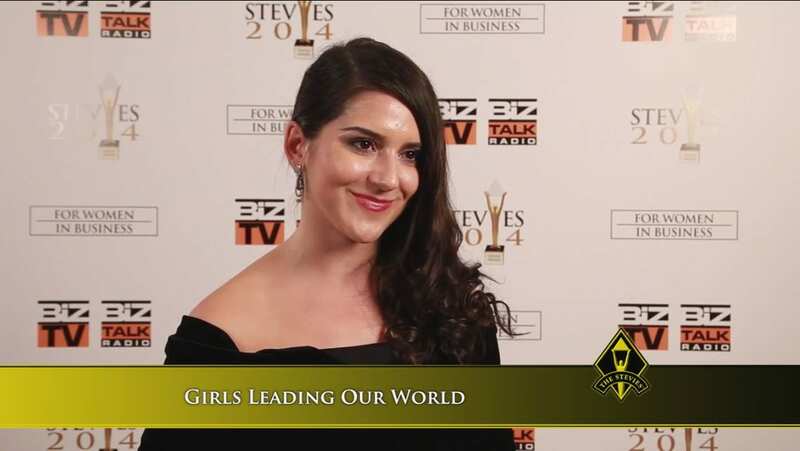 The annual Steve Awards were created to honor and generate public recognition of the achievements and positive contributions of businesswomen from around the world. Tsvetta was nominated for her work with the GLOW Leadership Program. Humble is an understatement when it comes to Tsvetta and the work she has done. For such a young woman to have done so much is truly inspiring! May the world recognize and celebrate more young women like Tsvetta. Her determination to make the experiences that helped her succeed available to other young women is what the women-helping-women movement is all about! WomenConnect4Good applauds her and hopes her example will inspire many other women around the world.